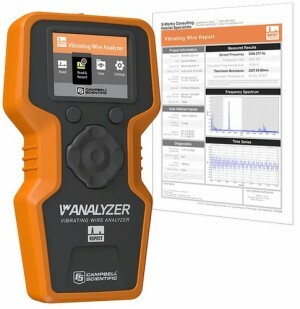 The Campbell Scientific Vibrating Wire Analyzer (VWA) is field ready and used to quickly measure a sensor, save the data, and communicate the results with custom PDF reports and spreadsheet output. The VWA uses spectral-analysis technology (VSPECTTM), which can be helpful for reading sensors in electrically noisy environments. The large color display offers an easy-to-view graphical presentation of the sensor output and operation, and a Project File maintains Site/Sensor information for 40 unique sites with up to 22 sensors per site. Site/Sensor locations are geolocated, allowing the internal GPS to guide a user directly to a sensor location. Site/Sensor and user information can be created or edited on the device or with a computer using the included VwProjects software. The Model GK-404 Vibrating Wire Readout Box is a portable, low-power, hand-held unit that is capable of running for more than 20 hours continuously on two AA batteries. It is designed for the readout of all Geokon vibrating wire gages and transducers, and is capable of displaying the reading in either digits, frequency (Hz), period (µs), or microstrain (µε) . The GK-404 also displays the temperature of the transducer (embedded thermistor) with a resolution of 0.1°C. The Model 8002 single channel datalogger is designed to read both the vibrating wire element and the integral thermistor of any Geokon vibrating wire sensor. Power is supplied by two ‘D' cells or by solar panel. 16,000 arrays can be stored (8,000 arrays when used with LogWare) before the oldest data is over-written. 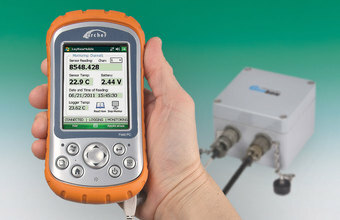 Strings of LC-2 dataloggers can be daisy chained using the RS-485 interface, and versions are available with radios and modems to provide remote readout capabilities. The LC-2×4 is a self-contained, multi-channel version of the 8002. The LC-2×4 provides 4 channels of vibrating wire (with thermistor) and is powered by two ‘D' cells or by solar panel. Data memory consists of 320K bytes of EEPROM, which translates into a memory storage capacity of 10,666 arrays. 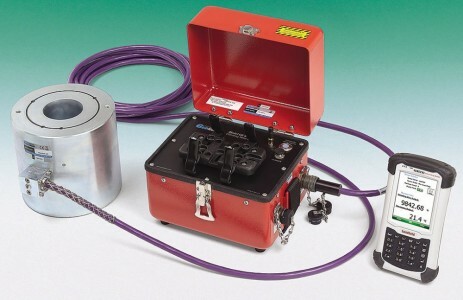 For large numbers of transducers or other non-vibrating wire sensors, we recommend using either the Campbell Scientific's CR800, CRVW or CR1000 datalogger along with the AVW200 or CDM-VW300/305 vibrating wire interface. This will provide maximum flexibility and extremely high level of signal processing ability.